This paper explores the architectural and historic preservation issues raised by seismic repair and retrofit work on masonry buildings. The first part examines the sources of meaning in historical buildings as cultural artifacts, using examples to illustrate how buildings can have significance beyond their visual image or architectural style. For this reason, if preservation is to be successful, the actual material fabric of an artifact must be preserved. This fact must be recognized by seismic design engineers so that seismic retrofit work can be carried out with the least possible irrevocable alteration to the historic structural system as well as the historic architectural finishes. The paper goes on to explore some of the opposing differences which have existed between contemporary conservation technology and seismic retrofit practice, analyzing how seismic retrofit work may be able to benefit from knowledge and research developed in the conservation field. In conclusion, the paper suggests four areas where further work is needed to improve seismic retrofit practice with historic masonry buildings: research on mortars and post-elastic behavior of the masonry, the development of existing building-type specific building codes, finding ways to limit liability for design professionals dealing with existing buildings, and further analysis on what is an acceptable life safety goal for historic buildings. Our approach to the structure of buildings has gone through a transformation in modern times. Traditionally, most major buildings were solid walled structures with the walls bearing directly on the ground. With the current predominance of steel and reinforced concrete as the materials of choice for larger buildings, we are now used to the erection of frames, onto which the enclosure cladding system is attached. With the "postmodern" fascination with historical forms and details, the contrast between the old and new systems has only recently become particularly noticeable. This style shift has brought back a desire to design buildings which have the solid walls of their historic counterparts, but which, unlike them, have to be constructed as a series of light, jointed panels attached to the underlying frame. Often the results simply fail to capture the kind of texture and meaning which is found in the older buildings. Architects continue to struggle for solutions, only to find that the source of the feeling they are trying to capture is simply not accessible in Dryvit, GFRC, Fiberglas, or panelized veneer brick, with their frequent need for expansion joints cutting across the architectural details. As engineers work hard to convert the highly indeterminate, ambiguous and nonlinear behavior of historic masonry construction into something which can be understood with mathematical certainty, architects struggle to wrest control of the seemingly rigid and unyielding materials of modern day conventional building systems, trying to breathe the kind of subtle life into them that they find at the root of the aesthetic quality of historic structures. This transformation in construction technology parallels a similar change in engineering practice which now relies to a great extent on frame analysis for the design of building structures. Traditional heavy wall masonry buildings tend to defy analysis by the usual present day methods, forcing many practicing professionals to do what they do not like to do - designing in part by guess work. Research in the area of unreinforced masonry is so important because without it, historical buildings will be lost simply because engineers and architects will be loath to touch them because they cannot be made to fit their mathematical design models. This may be true even though the same structures have withstood major past earthquakes, and the damage record is known. For example, a number of historic buildings in California which survived the 1906 San Francisco earthquake are threatened now more by hazard mitigation legislation than by future earthquakes. Modern engineering science, new materials and current codes have gone a long way towards reducing the fear of catastrophe and death from earthquakes. This has been true despite the spectacular failures which each major earthquake seems to leave in its wake. Earthquake design is an evolving and constantly changing practice largely because the actual events are so rare, and when they do occur, the earthquake forces can be so large that some structural damage is expected even in new structures. As a result, the line between acceptable and unacceptable risk and performance is vague and fluid. In the field of historic preservation, the problem of seismic risk cannot be solved by stricter design codes, better new materials, or a more stringent engineering design. It is exactly these things which heighten the dilemma with older structures, threatening the very historical qualities which we seek to save. It has become a familiar sight in many parts of the world to see the stone exterior walls of gutted buildings held up by shoring while they await the construction of new interior floors and roof. Fine old masonry buildings are often stripped of their interior finishes, with the steel reinforcing rods being erected against the inside of the exterior walls in preparation for a sheet of concrete. Roofs of ancient tiles or slate are torn off to be replaced by new tiles and slate after the obligatory concrete or plywood diaphragm is installed. The professional and scientific view of the environment usually suppresses its meaning.... Environmental professionals have not been aware of the symbolic content of the environment, or of the symbolic nature of their own plans and projects.... Professionals see the environment as a physical entity, a functional container,...a setting for social action or programs, a pattern of land uses, a sensuous experience - but seldom as a social or political symbol (Appleyard 1978). It is in that golden stain of time that we are to look for the real light, and color, and preciousness of architecture; and it is not until a building has assumed this character, till it has been entrusted with the fame, and hallowed by the deeds of men, till its walls have been witnesses of suffering, and its pillars rise out of the shadows of death, that its existence, more lasting as it is than that of the natural objects of the world around it, can be gifted with even so much as these possess of language and of life (Ruskin n.d.). Seismic protection and strengthening forces us to confront one of the central dilemmas of historic preservation - the fact that preservation is forced to encompass change and renewal. Unlike maintenance and rehabilitation from decay, a seismic project may tear apart a building which was otherwise in good repair and make it almost entirely new. In such an instance, only the image, rather than the substance, of much of the historic fabric is preserved. Masonry buildings are particularly vulnerable to this approach. Sometimes seismic projects are promoted as opportunities to "restore" the original appearance of a buildings, stripping away the later alterations in order to return them to their original appearance. In Sacramento, California, the State Capitol is such an example. The Capitol was completely gutted in 1976, leaving only the exterior walls and the central drum and dome. All of the interior floors and walls were removed and replaced in reinforced concrete. The remaining masonry was covered with an internal skin of shotcrete and the floors were replaced in reinforced concrete. As a result, while the interior of this building is now genuinely spectacular, with impressive museum rooms, excellent craftsmanship, rich materials, stunning colours and textures, none of it is genuine. A "heart transplant" was authorised when an "ace bandage" may have been all that was needed. The Capitol needed to be strengthened and repaired, but one should ask whether the risk identified in 1971 could not have been satisfactorily alleviated by less drastic, destructive, and expensive measures. The quest for authenticity, and the search for "real" meaning through "honesty" of form, often leads to the destruction of that which it seeks by inducing fakery....Authenticity is not a property of environmental form, but of process and relationship....Authentic meaning cannot be created through the manipulation or purification of form, since authenticity is the very source from which form gains meaning (Seamon & Mugerauer 1985). This gutting of structures for seismic strengthening is not limited to the United States. For example, following the 1979 earthquake in Montenegro, Yugoslavia, many structures in the historic city of Kotor have been reconstructed with reinforced concrete floors, replacing the original heavy timber. In some of these structures, reinforced concrete columns have been cut into the masonry, forming completely new reinforced concrete structures, with the historic masonry reduced to a veneer. Another example, in Portugal, is the little mountain village of Piódau. The Portuguese government recently listed this picturesque mountain village of stone buildings as an historical site. Located in earthquake-prone country, many of the stone houses are being strengthened. The typical seismic strengthening consists of replacing their timber floor and roof structures with reinforced concrete. Some of the walls, which had been laid with very little mortar, are being re-laid in strong cement mortar. While undoubtedly safer, the visual effect of this work is the loss of the texture and feel of the traditional surfaces. The patina and sense of the country masons' and plasterers' handiwork is erased. If the approach had been to repair and augment the timber interior structures and tie them to the existing walls, rather than replace them, the historical quality of the buildings would have survived the life safety improvements. The debate over such alternatives always turns to the question of how much life safety protection is enough. When existing archaic construction remains in use, even if improved, can it be relied on to perform adequately? However, at the core of this issue is the fact that, unless the architects, planners and engineers identify and understand the importance of the original structural and interior fabric of the historical buildings, and bring this understanding into their designs, such destruction will continue because they will do what they are used to doing with new structures. This consideration must include the evidence of the original handiwork, rather than just the appearance of a building from a distance. Another striking example is South Hall at the University of California, Berkeley. Constructed of brick with timber floors in the 1870s, South Hall is the oldest surviving building on the campus. In the 1980s, it was gutted to undergo seismic strengthening under the University's campus-wide program. The retrofit plans included the reinforced concrete "shotcrete" jacketing of the inside surface of many of the exterior walls, and the demolition and replacing of the timber floors with steel and concrete. In the process of carving channels into the walls, it was discovered that the original builders had installed bond-iron in the masonry - continuous bars of wrought iron which extended from corner to corner above and below the windows in all of the building's walls. Dog anchors, which secured the floors to the walls, were also discovered hidden in the walls. At the corners, the bond iron bars were secured by large bosses on gigantic cast iron plates which formed part of the architecture of the building. Because the designers had never thought to investigate the structural history of the building, including whether these great cast iron ornamental plates on the corners of the building served a structural purpose, the existence of the bond iron was not known until the demolition for the retrofit. All of these bond iron bars were cut as a result. In addition, as historically significant and advanced as this original system was, no recordation of its design was ever conducted. The irony was that one of the engineers said that, had they known of the existence of the bond iron and the dog anchors, their designs may have been different and less extensive. When it was discovered, however, it was too late to change the designs, and the early seismic technology was destroyed. One may ask, "why is it important to preserve what had been hidden in the historic walls - nobody could see it anyway?" Perhaps documenting it, which was not done, would have been sufficient, but this example also illustrates one of the important points about seismic design - that is that many engineers and architects have the false belief that the today's engineering design is, not only better than anything which has been done in the past, but is the ultimate solution which will require no further interventions. They believe that their work will make the building strong and complete, and that no-one will have to do anything other than maintenance and superficial remodeling ever again. Here, at South Hall, the designers failed to know what had been put into the walls to resist earthquakes a mere 100 years ago, despite the fact that great cast iron plates to which the bond iron straps were attached, were fully exposed on the outside of the building. What is there to make certain that our successors will be any better informed about the work done today? In addition, with the irreversible conversion of the masonry walls of South Hall into a veneer of masonry on reinforced concrete, the integrity of those walls as masonry walls was destroyed. One of the principal advantages of masonry is that it can be repaired by being dismantled and re-laid. Now it has been fused together into one solid mass of unyielding concrete. Years later, it will not be possible to repair the brickwork or replace the concrete jacket because of rusting of the re-bars or for any other reason. The present-day seismic work will indeed last the life of the building simply because the building's life is now forced to be limited to that of the new work. This point may seem far-fetched, but historical buildings are worthy of such long-term consideration. It should be remembered that the 19th Century restorers of the Parthenon introduced iron cramps which, when they rusted in the 20th Century, destroyed some of the original marbles. Should anyone wonder whether the state-of-the-art at the time of the 19th Century restoration represented progress from earlier times, they should consider the fact that the ancient builders had used a less rust-prone iron, which, when protected by a lead jacket, survived over 2,000 years to this day without distress. Many people make the mistake of thinking that it is only our generation which has discovered ways of resisting the threat of earthquakes in structural design. They come to believe that older forms of construction practice must be more dangerous simply because they were designed before current seismic codes were promulgated, or before current engineering knowledge about earthquakes had been developed. Certainly, the introduction of steel provides ductility where masonry could not, and yet the recent discoveries of the failures of the welds in over 100 of the 400 steel buildings affected by the Northridge Earthquake should provide some humility in the face of this awesome force. While many masonry buildings have tumbled in earthquakes, they have not always tumbled. As was witnessed in Armenia recently, it was the modern reinforced concrete buildings which collapsed, killing thousands, while the older masonry buildings nearby remained mostly intact, providing refuge for the displaced occupants of the newer buildings. In places as diverse as Turkey, Yugoslavia, Kashmir and Nicaragua, indigenous forms of construction were developed or adapted to respond to the earthquake threat where available resources demanded that masonry continue to be used. In Kashmir, an elaborate system of interlocking horizontal timber runner beams was used, without vertical wood columns, to hold the rubble masonry and soft mud mortar buildings together on the silty soil. Historical reports confirm that these buildings withstood earthquakes better than the nearby unreinforced brick palace and British-built government buildings. Today, many of these vernacular structures are falling in favor of reinforced concrete structures, which, because of poor local construction practices, may actually prove to be less resistant than their "low tech", unengineered historic predecessors. Restoration professionals sometimes fail to understand the subtleties of seismic resistance in older structures. Believing that strength and stiffness is necessary, they destroy original construction systems to gain sheer strength at the expense of earlier solutions which may still be valid. In Dubrovnick, before the recent civil war, restorers of the historic palace uncovered an interior wall they had thought was solid masonry to find a basket-weave of small timber studs, with brick or stone masonry loosely fitted together between the studs. The restoration engineer stated at a conference that this "poorly constructed wall was immediately removed and replaced during the restoration of the building". Instead of being "poorly constructed", this wall deliberately may have been constructed in this fashion to resist earthquakes. The wall, which was similar to Bahareque construction found in Central America, may have represented a far greater understanding of seismic engineering than pre-modern builders are given credit for today. The use of lime-sand mortar ... furnishes a plastic cushion that allows bricks or stones some movement relative to each other. The entire structural system depends upon some flexibility in the masonry components of a building. A cushion of soft mortar furnishes sufficient flexibility to compensate for uneven settlement of foundations, walls, piers and arches: gradual adjustment over a period of months or years is possible. In a structure that lacks flexibility, stones and bricks break, mortar joints open and serious damage results (McKee 1980 - tense changed for clarity). This was not meant to refer to masonry in earthquakes, but in light of the Kashmiri experience it is intriguing to ask, whether the notion of a "plastic cushion" might be an appropriate concept for walls subjected to earthquake forces. It is worth noting the conflict between the Historic Preservation documents which recommend using the weakest and most lime-rich ASTM formula (K) 1 unit cement to 2.25-4 units lime for restoration work, and the Uniform Building Code, which prohibits the use of mortar weaker than the three strongest categories, known as ASTM types M, S & N: 1 unit cement to 0.25-1.25 units lime) for any mortar used in structural masonry (which includes, of course, most historic masonry walls). One reason for this conflict is that while the Code is founded upon the performance of the wall under load at its design strength at the point of construction, the preservation documents are aimed towards maximizing the long-term durability of walls with relatively weak masonry units in response to all environmental conditions. One only needs to compare the long-term performance of ancient masonry and modern masonry to see the merits in the softer, high lime mortars, and yet, the codes now make beneficial use of this knowledge difficult. Other examples abound where modern uses of masonry has proven short-lived because of environmental degradation of the system. Seismic design must fit into a larger performance picture, where other environmental assaults are considered as well as the occasional earthquake. Concerns over the impact of seismic strengthening policies is more than just one of potential loss of original fabric; it is also one of economics. As long as politicians and the public believe that historic masonry buildings are enormously risky unless great sums of money are spent to convert their structural systems into steel or concrete, vast numbers of important cultural monuments are at risk. This issue has expanded recently in the United States to include large-scale 20th Century masonry buildings constructed with steel or concrete frames. It is exactly the current crisis with these types of buildings which confirm the importance of engineering research and the development of specialized codes for masonry buildings and historic buildings in general. The crisis can be illustrated by an example in Oakland, California, where one brick- and terracotta-clad steel frame historical building, the City Hall, is being repaired from Loma Prieta Earthquake damage and seismically upgraded at the extraordinary cost of $530 per square foot ($5,700/square meter), which is more than 3 times the cost of a new building of comparable quality. Six blocks away, another office building, the Oakland Medical Building, was just repaired and seismically upgraded to the same codes for a cost of only $11 per square foot ($118/square meter). The City Hall design uses the now popular newly developed base isolation technology, while the Medical Building is a fixed base design, but both schemes were promoted as "cost-effective" designs to meet the requirements of the building code (see Figure 1). With a difference between two projects, both promoted as necessary and expedient, of over 35 times, it is evident that there is little consensus in this particular field over what is required and beneficial to meet the seismic threat. While certainly the expected performance of the base isolated design is greater than the fixed base design, and even though part of the difference is for interior remodeling of the City Hall, it is questionable whether this justifies 35 times the cost. 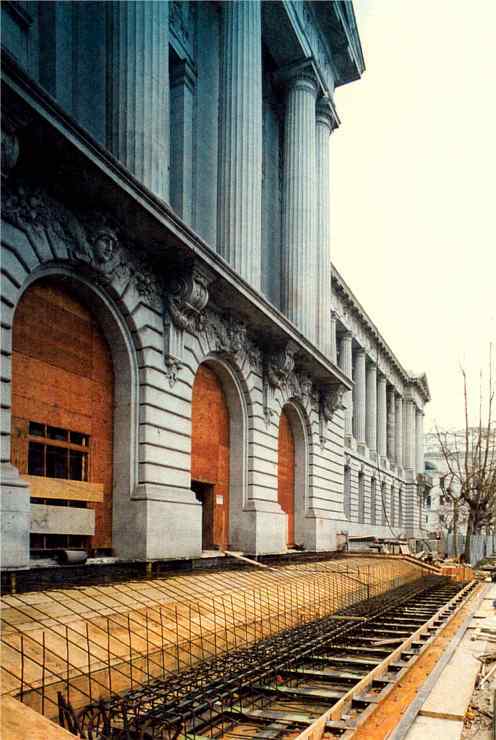 While many celebrated the repair and upgrade solution for City Hall because it preserved the building, historic preservation suffers in the long run from such gargantuan projects as that of the Oakland City Hall because the public begins to believe that such costly solutions are the only way to make such buildings safe. The situation with bearing wall masonry buildings in California is no longer as distorted. The reason for this is that recent research has resulted in the development of a new code specific to this building type. While public perception on the safety of masonry buildings is still unduly negative, and price spreads between different engineers' designs can still be large, the existence of this new code has helped to narrow the spread, and make economical solutions possible. Figure 1. Cost comparison between two retrofit projects. The code for masonry buildings, which has now been adopted as a model code in California is Appendix, Chapter 1 of the Uniform Code for Building Conservation. This appendix contains the engineering provisions for bearing wall masonry structures. These provisions were derived from the "ABK Methodology," an engineering design methodology for unreinforced masonry bearing wall buildings developed by a team of engineers in Los Angeles under a research grant from the National Science Foundation. One of the principal features of this methodology is the provisions which anticipate and exploit the post-elastic behavior of the wood and plaster interior partitions and floor diaphragms, thus computing a consequential reduction in the forces on the masonry walls. Another result of the ABK research is the finding that masonry buildings actually respond differently from the way the traditional codes and engineering approaches assumed. Rather than amplifying the forces of the earthquake, the heavy masonry-walled building has the effect of dampening the shaking by acting as a "rigid rocking block on a soft soil base". This is to be compared with the common code analysis of seismic force on a building which models the building as a "single degree of freedom, 5% damped elastic oscillator with a fixed base" (Karitois et al. 1984; Kariotis, J. 1989, pers. comm., 3 June). Using the ABK method of analysis, the computed force levels in an unreinforced masonry building are lower than found under conventional code analysis. The results of this methodology on the design of retrofit strategies for individual masonry buildings is that the amount of strengthening work which is computed to be required is less than that shown as needed when conventional strength based linear elastic analysis is used. This approach thus reduces the retrofit intervention and costs. An even more significant step for historical buildings in general has been taken in California with the adoption of the State Historical Building Code. This Code, which applies to all historical buildings, including even those which are only on local lists, allows much greater design and engineering flexibility than is possible under the conventional prevailing code which is primarily meant for new buildings. Instead of prescriptive requirements, the State Historical Building Code describes general performance objectives which must be met. The specific solutions are left up to the designers. The code also encourages the use of archaic materials and systems as part of the structural system, providing some minimum values for these systems where they are available. 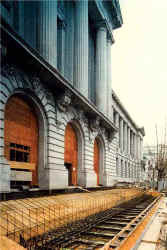 San Francisco City Hall during construction of Base Isolation system. The front steps must be reconstructed to be able to slide when the building moves. Three topics for further research, which would benefit masonry building preservation particularly, come to mind. One is the study of the effects of mortars of varying strength and constituents, a second is further study to develop code values for stone masonry, particularly with a random ashler or rubble wall bedding pattern, and a third is further study on the post-elastic in-plane strength and behavior of masonry bearing and infill walls. Most masonry wall studies have not introduced mortar strength and mortar ingredients as the principal variable in laboratory experiments. The potential benefits of high lime mortar in construction are well-known in the field of building conservation technology, but not adequately explored in terms of its effects on seismic performance. Historic walls are often treated only as dead load in lateral capacity analysis because of low mortar strength, but when combined with certain bedding plane and window-frame reinforcing techniques, the performance of such walls may be made satisfactory by restraining deformations and avoiding collapse potential, while allowing for cracking and energy dissipation. The objectives of such research would be to establish a sound basis for the preservation of the integrity of historic stone and brick masonry by avoiding the need for destructive concrete coatings. The most important attribute of mortar strengths below that of the masonry units is that, when the wall does crack, it does so along the mortar joints. This results in greater overall stability than if the units themselves were to fracture. At the 1988 International Brick/Block Masonry Conference in Dublin, a paper by Dr. W. Mann, University of Darmstadt, generated criticism around the assertion that masonry bedded in mortar with "low cohesion [is] favorable" because it contributes to a type of "ductile" behavior. Such a statement is diametrically opposed to the conventional wisdom that mortar must be strong to resist earthquakes. However, in the traditional examples described above, where the weak mortar is combined with the overall flexibility of the building structure, the restraint provided by the timber beams, and the pre-compression provided by the weight of the overburden, weak mortar may be more resistant to catastrophic fracture and collapse by allowing the cracks to be distributed throughout the wall. The flexibility and internal damping of the structure can serve to change the building's response, reducing the out-of-plane forces in the masonry walls while the timber serves to keep the weaker masonry in place. While research has shown that weak mortar can cause problems with unreinforced masonry walls, particularly for out-of-plane shaking, perhaps some mechanical ties within the walls can fill the role that the timbers did in traditional construction by holding the masonry units in place while the wall deforms. There has been some significant progress in this direction in Europe, and even in New Zealand. In Greece and New Zealand, several projects have achieved seismic strengthening by simply wrapping cables around the masonry structure, which are hidden by the stucco, or left visible on the surface. Utilizing the strengthening effect caused by tying the masonry together to create horizontal bands similar in their purpose to the timber runners of the Dhajji-Dewari system, these buildings continue to bear their own weight on the unaltered existing masonry. Such systems have the advantage of causing little disruption to the historic masonry surface or the integrity of the wall. The cables are also accessible for inspection and can easily be replaced. What is radical about this and other surface-mounted strengthening systems is that the retrofit work is left visible as a frank statement of this part of the building's historical evolution. Sometimes it is important to recognise that, as was the case with South Hall, greater damage may be incurred by making changes hidden behind walls which have been radically altered or rebuilt, than by exposing the changes in front of walls which are thus left intact. There is a need for more information on capacity values for rubble and random ashlar masonry which can be introduced into the building codes. Engineers are loath to apply the values which have been developed for brick masonry, but the recommended test techniques, such as the push test, are only remotely applicable to stone masonry situations. Lacking even minimum code capacity values, the conservative approach is to impart little or no capacity to the existing masonry. In the United States, this has resulted in costly and invasive designs for many stone buildings and the unnecessary demolition of a number of important historical buildings because retrofit schemes proposed proved to be too expensive. More research is also needed on the post-elastic behavior of masonry of all types. Even the recent unreinforced masonry building codes developed in California stop short of including values derived from the behavior of masonry when it is cracking and yielding in an earthquake. The codes for present-day construction such as steel and reinforced concrete are based on linear elastic calculations using reduced forces to approximate post-elastic actual behavior, but designers often give very low values to masonry because of its lack of material ductility. However, as a system, there is substantial remaining capacity in a wall which has begun to crack before it becomes unstable. If buildings fell down the moment masonry walls exceeded their elastic strength, there would have been far greater death and destruction in past earthquakes. Practicing engineers are often loath to depend on masonry for part of the load-resisting mechanism because of the lack of realistic code values on which to base their design, and thus protect their liability in the event that an earthquake exceeds the strength of the wall. The adoption of the Uniform Code for Building Conservation as a State of California's model code for existing buildings, and the enactment of the State of California Historical Building Code have both gone a long way to allowing for sensitive and cost effective improvements to historical buildings in California. A code specific to the masonry infill frame building type is under development by a team of California engineers. The absence of such a code has been made conspicuous by the breadth of costs between different projects, and the sometimes acrimonious disagreements over what strengthening is necessary. In Europe, as the European Economic Community has moved towards unified building codes, the problem of making existing buildings, particularly historical buildings in different countries, fit into the a single universal code must be dealt with. It is strongly recommended that a separate code for historical buildings be developed. Like the State Historical Building Code in California, this code should be based on performance objectives, rather than prescriptive construction procedures or systems. An Internationally standard code which applies to new and old buildings alike, will fail to cover the specific needs of historical building types which vary from region to region. What may be sound practice in one area, may be destructive of cultural value in another. Provisions for existing buildings with archaic construction systems and earlier interior layouts, must be included into alternate codes or many buildings will be lost. A discussion of codes inevitably leads to a discussion of the problems surrounding professional liability. In the United States, many preservation problems result from the fact that engineers and architects are afraid of malpractice claims if they undertake solutions which are different from the code, and if damage occurs in an earthquake. This has often forced them to be more conservative with existing masonry buildings than they would have to be with new buildings. This is true because the code for new buildings, although expecting structural damage to occur in a major earthquake, is very specific in the construction requirements. With old buildings with archaic pre-code structural systems which cannot be made to meet the letter of the current code, designers feel vulnerable to lawsuits regardless of the level of damage. In a sense, present-day professionals thus feel forced to take responsibility for the performance of the existing building structures designed by others before their time, when all they have been hired to do is to provide some improvement to them. As a result, the owner's desire for the most minimal upgrade often balloons into a major expensive project, with hundreds or thousands of pages of engineering analysis and justification. For every project of this kind which is constructed, hundreds of buildings remain without any improvements because of the severe cost and liability implications if they are touched at all. Finally, a discussion of appropriate codes, professional liability and even topics for scientific research must include also a discussion and resolution of what level of seismic protection is necessary. Codes serve to establish a lower bound of performance, but they are not designed to provide guidance as to what should be the upper bound. Economic forces are expected to provide this, but in the field of seismic upgrading, particularly for large public projects involving government funds, confusion over how much is enough has prevented people from reaching consensus on this issue. This has been true largely because the issue of life safety is so unclear. It is as laudable as a goal as it is vague as a benchmark. For example, while modern building codes assume structural damage may occur to a code-conforming new building in the event of an earthquake, many engineers and architects are loath to define what is acceptable damage for historic masonry buildings, resulting in vast expenses for new supporting structural systems. What had been acceptable only 50 years ago, is now suddenly unacceptable. In the case of frame and infill masonry buildings, provisions are sometimes even made to resist the potential of collapse in building types which have not had a history of collapsing in earthquakes in the past. Historic structures have something to tell us which transcends their formal architectural language. This gift from the past can be erased if the integrity of the original structure is destroyed to meet the demands of hazard mitigation. Understanding both the positive and the negative attributes of masonry construction can guide us towards methods which may be less destructive of original fabric. Some of these methods may even be more effective over the long-term, not only because they build on strengths which already exist, but also because they are more closely derived from local, social and economic conditions. The purpose of historic preservation is not limited to the static freezing of artifacts. It also has to do with preserving continuity within the slow evolution of building traditions - a continuity which may in the end provide the most effective and lasting defense against earthquakes. Regardless of whether a masonry building is modeled by an engineer as a "rigid block on soil springs", or as a "non-ductile, rigid mass on a fixed base", in truth it has life. It moves, it changes color, it ages and it responds to our own images and dreams of what buildings should be. By "moves", this is not intended to mean falling down in an earthquake, but rather the slow and subtle movement over time - by the heat of the day - by the gradual settlement of the foundations - or by the slow erosion of the mortar bed or of the bricks or stones themselves. This almost organic quality is essential to the aesthetic quality of historic masonry. If we could arrest the effects of time, traditional masonry might lose its magic. Even in earthquake country, it is this essential quality of building which must be preserved. The Environment as a Social Symbol: Towards a Theory of Environmental Action and Perception, Berkeley Institute of Urban and Regional Development, U.C., Berkeley, unpub. the Seven Lamps of Architecture. Dwelling, Place and Environment: Towards a Phenomenology of Person and World, Martin Nijhoff, Dordrecht. Masonry, National Trust/Columbia University Series, Washington DC. ABK Methodology for the Mitigation of Seismic Hazards in URM (unreinforced masonry) Buildings, ABK, A Joint Venture, National Science Foundation Topical Report 08, January, pp. 2-4.